History matters, and God has acted within history to bring about His salvation plan. In From Abraham to Paul: A Biblical Chronology, author Andrew Steinmann presents an accessible timeline of biblical events with the result that while there is much we do not know, there is also much we can know from Scripture with confidence. The following excerpt is offered in anticipation of the Church's commemoration of the patriarch Abraham on October 9. From these dates the rest of the dated events in Genesis for the lives of Israel’s patriarchs can be determined. The sojourning of the sons of Israel which they sojourned in Egypt and in the land of Canaan was 430 years. LXX Exod 12:40 includes the time that Israel was in Canaan in the 430 years. Thus, it is claimed that Israel was in Egypt 215 years. This can be calculated by adding together Jacob’s 130 years before entering Egypt (Gen 47:9), Isaac’s 60 years before Jacob was born (Gen 25:26) and Abraham’s 25 years in Canaan before Isaac was born (Gen 12:4; 21:5). This leaves 215 years for Israel’s time in Egypt. Advocates of this view support their assertion by noting that Abraham was told that his descendants would return from Egypt “in the fourth generation” (Gen 15:16). It is claimed that 215 years is a more reasonable time for four generations than is 430 years. Moreover, advocates of a 215 year sojourn in Egypt claim that Paul in Gal 3:17 has the time from Abraham to the giving of the Law on Sinai in mind when says the Law “happened 430 years afterward” (ὁ μετὰ τετρακόσια καὶ τριάκοντα ἔτη γεγονὼς νόμος). This would accommodate a 215 year sojourn in Egypt but not 430 years. There are multiple problems with this theory, however. First of all, it should be noted that elsewhere in Scripture, Israel’s time in Egypt is reckoned to be about 400 years in round numbers. Thus, God told Abraham that for 400 years his descendants would be strangers in a land that was not theirs (Gen 15:13). This passage is quoted by Stephen in Acts 7:6. Second, Israel grew from some seventy persons when Jacob entered Egypt (Exod 1:5) to over 600,000 men twenty years old or older at the Exodus (Num 1:46). This would hardly be possible in four generations over 215 years, but is entirely possible in 430 years. Third, Paul’s reference to 430 years in Gal 3:17 is not from the time Abraham entered Canaan to the time of the Exodus, but is clearly 430 years from the time that the covenant “previously had been ratified” (προκεκυρωμένην). Paul most likely had in mind the covenant to Abraham that contained the promise about Abraham’s descendants’ sojourn in Egypt as given by God in Gen 15. Note that Gen 15 previously mentioned a foreign sojourn as slaves for 400 years (Gen 15:13). Therefore, Paul probably considered Jacob’s entry into Egypt as the ratification of the covenant. This would also make sense with Paul’s statement in Acts 13:17–20 that Israel’s time in Egypt, in the wilderness, and the time when Joshua apportioned the land among Israel’s tribes was “about 450 years” (ὡς ἔτεσιν τετρακοσίοις καὶ πεντήκοντα). The actual time was 477 years, which is reasonably approximated as “about 450 years.”  Thus, Paul in Acts 13:20 and Gal 3:17 considered Israel’s time in Egypt to be 430 years. Fourth, the “fourth generation” of Gen 15:16 should be understood in context. The word דֹר, “generation,” can reference a person’s entire lifetime. Since Abraham, Isaac and Jacob all lived well over 100 years, “in the fourth generation” may well be intended to indicate somewhat less than four complete lifetimes in terms understandable to Abraham. Finally, Larsson notes that a comparison of Pentateuchal chronologies between MT and LXX reveals that LXX translators tended to alter the Hebrew text’s chronology where the text is difficult to understand or was viewed as self-contradictory. This appears to be the case at Exod 12:40, since LXX adds “and in the land of Canaan” after “in Egypt” when chronologically the Patriarchs’ sojourn in Canaan came before Jacob’s entry into Egypt. Moreover, both MT and LXX have “400 years” at Gen 15:13, making LXX Exod 12:40 likely a LXX alteration that thereby unwittingly created a conflict between LXX Exod 12:40 and LXX Gen 15:13. Therefore, there is little to support the theory that Israel was in Egypt 215 years. Instead, the MT’s 430 years should be accepted as accurate. Abraham lived to be 175 years old (Gen 25:7). Thus, the events of Abraham’s life took place from 2166 to 1991 BC. This means that Abraham lived to see the birth of his grandsons Jacob and Esau (2006 BC) and died when they were fifteen years old. The first datable event in Abraham’s life is his obedience to God’s call to leave Haran, which happened in 2091 BC when he was 75 years old (Gen 12:4). After ten years in the land of Canaan (2081 BC) Abram married Hagar (Gen 16:3). Ishmael was born the next year (2080 BC) when Abram was 86 (Gen 16:16). Ishmael lived 137 years, dying in 1943 BC (Gen 25:17). In 2067 BC when Abram was 99, God changed his name to Abraham and promised that Isaac would be born the next year (Gen 17:1, 21, 24). Ishmael was thirteen at the time, confirming that he was born in 2080 BC (Gen 17:25). Between the time that Abram was renamed Abraham and the birth of Isaac, Sodom and Gomorrah were destroyed (Gen 18:16–19:29). Therefore, Sodom and Gomorrah were destroyed in 2067 or 2066 BC. If Jacob was almost 131 years old, he could have been born in 2007. For the sake of simplicity, however, all birth and death dates will be listed by as single year instead of using some other notation such as 2007/2006. At Acts 13:20 some manuscripts, especially those of the Byzantine Koine tradition, transpose the phrases “and after this” (καὶ μετὰ ταῦτα) and “430 years” with the result that the 430 years terminate with Samuel instead of the beginning of the period of the judges. This reading is reflected in the King James Version at Acts 13:20. However, this is clearly a secondary reading. The better reading, which places the 430 years before the judges, is also the reading of the Vulgate. It is impossible to place all of the events from Jacob’s entry into Egypt to the time of Samuel into a 430 year period unless one almost completely discounts the chronological information in Judges as mistaken or fictional. 430 years in Egypt, 40 years in the wilderness and 7 years before the land was distributed. If Paul was using the 400 years of Gen 15:13, then the period is 400 + 40 + 7 = 447, even more reasonably an approximation of 450 years. The seven year period can be reckoned by noting that in Josh 14:6–12 Caleb requested his land 45 years after having been sent by Moses to spy out the land in 1444 BC, two years after the exodus from Egypt. Thus, there were 47 years from the exodus to the distribution of the land among the tribes of Israel. Larsson, “The Chronology of the Pentateuch.” However, Larsson considers the time in Egypt to be “about 300 years,” an estimate based on no explicit statement in the Pentateuch (Larsson, “The Chronology of the Pentateuch,” 406). From From Abraham to Paul: A Biblical Chronology, pages 67–72 © 2011 Andrew E. Steinmann, published by Concordia Publishing House. All rights reserved. 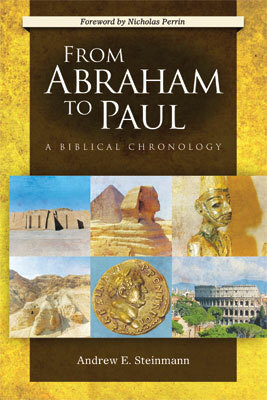 To order From Abraham to Paul, please contact CPH at 800-325-3040 or visit www.cph.org.